Fondly known as "home away from home" to our many returning guests! Comfortable and affordable, with excellent service! Great value, cosy & compact studio unit on the ground level, with a queen bed, tea and coffee making facilities, microwave, toaster, fridge freezer and a large, separate ensuite bathroom with shower, toilet and vanity unit. 42” plasma TV, 6 Sky TV channels (including 2 sports channels), free local and national phone calling, free WiFi. Outdoor seating area. Please Note: no full kitchen, no room for an additional bed in this unit, queen bed only. 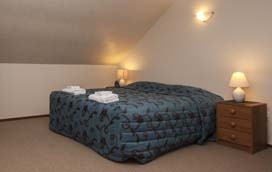 Super spacious units on the first floor, with a super king bed in the lounge. *If required* This unit converts to a larger space with an extra bedroom containing 4 single beds). Full kitchen, including oven, microwave and fridge freezer. 42” plasma TV, 6 Sky TV channels (including 2 sports channels), free local and national phone calling, free WiFi, own heat pump. An upstairs unit with its own private patio to enjoy the morning sun. 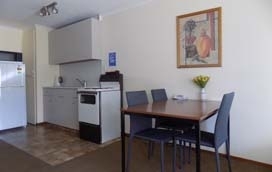 King bed, tea/coffee-making facilities, toaster, fridge, electric frypan, microwave, ensuite. 42" plasma TV, heat pump/air cond, free WiFi, free local and national calls. 6 Sky TV channels. 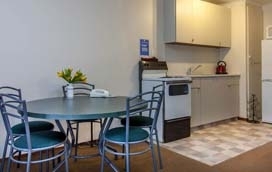 Spacious units, full kitchen facilities with stove, fridge/freezer, microwave. 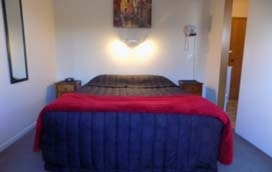 Super King and single bed in lounge, 2 single beds in bedroom. 42" plasma TV, heat pump/air cond, free WiFi, free local and national calls. 6 Sky channels. Super spacious 2 bedroom units on the ground floor, with a single bed in the lounge, king bed in bedroom 1, and 2 single beds in bedroom 2. Full kitchen, including oven, microwave and fridge freezer. 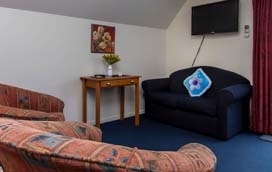 42” plasma TV, 6 Sky TV channels (including 2 sports channels), free local and national phone calling, free WiFi, own heat pump. Our Cancellation Policy is waived if your booking is cancelled 48 hours before the date of reservation. If a reservation is cancelled with less than 48 hours notice then a cancellation fee may be charged to your Credit Card. The cancellation fee may be waived at the proprietor's discretion, if the booking can be replaced prior to the booked date of the arrival. A maximum of one days accommodation or the period booked (which ever is the lesser) at full rack rate may be applied as the cancellation fee. Earlier departure than the reserved date will incur the full cost of the period booked, unless the unit is resold for the remainder of the booking. All units are strictly no smoking. If you wish to smoke, there are ashtrays situated outside the units for your convenience. We reserve the right to charge up to $300 to restore the room to the same clean condition prior to use. This will be charged to the registered guest. We reserve the right to reallocate rooms due to circumstances beyond our control. If final numbers increase or decrease significantly from those advised at the time of reservation, we may substitute a more appropriate room of our choice. We will endeavour to discuss any changes with you when the decision is made.